There is a definite difference between sweet potatoes and yams. 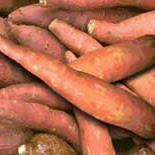 Sweet Potatoes are readily found in grocery stores. Yams are not commonly found in North America, but are sometimes imported from the Caribbean.